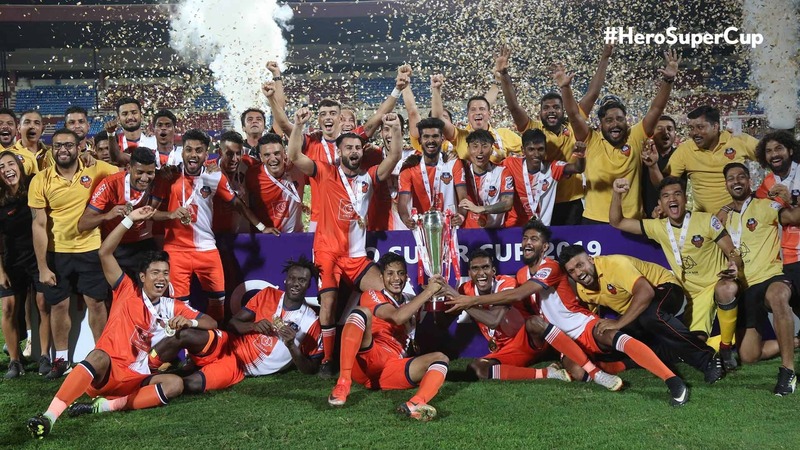 FC Goa emerged as champions of the 2019 Hero Super Cup after they beat Chennaiyin 2-1 in a tense affair at the Kalinga Stadium in Bhubaneswar on Saturday. Ferran Corominas opened the scoring in the 51st minute with a simple tap-in. Raphael Augusto’s deflected effort brought Chennaiyin back level. Despite Goa being billed as the favourites to take home the crown, it was Chennaiyin, who started the game as the better of the two sides. Rafael Augusto, Anirudh Thapa and Dhanpal Ganesh controlled proceedings from midfield. As the game crossed the 20-minute mark, Chennaiyin started imposing bundles of pressure on the Goa defence. They would create three consecutive chances in a space of three minutes but could not make any of them count. The first would fall to Augusto, who’s effort from Thapa’s cutback was brilliantly blocked by Mourtada Fall, denying an almost certain goal. At the post-match press conference, the FC Goa head coach, Sergio Lobera was accompanied by striker Ferran Corominas. The boss went first and explained how his team deserved to win the title after such a successful season. “We could have won two trophies this season. But we won the admiration of all the people in India and that is really big. I think we were tactically better. We could and should have scored the third goal. Not doing that made it a little tough for us in the end,” he said. “This is all because of our players. They have been great. If you look back, the history suggests we deserved a trophy for a long time now. I think we have got the acclaim from all people. We will now look to build on that. We will look to strengthen last season and look to do what is left next season,” he added. “Congratulations to Goa. They are a team that just missed out on the Hero ISL, but they managed to get themselves a trophy. Sergio is not only a good coach but he also a good human being as well. We offer our congratulations to him, his staff and his players,” he added.